Raw gold ore is beautiful in it’ s natural state. Shiny and pure it is something to behold when found nestled in the hard granite or quartz rocks. Since gold is a naturally soft ore, it must be smelted and refined to strengthen it for common uses. This refining process involves melting the gold ore down and mixing other metals with it to produce a strong and durable alloy so that it can be made into jewlery, electronic, and other common products. As a Christian there is going to come a time in your life that you too will undergo a refining process. This is your Baptism of Fire (Matthew 3:11). As a newly re-born Christian, you were saved, and became (hopefully) baptized. Maybe at your church, or a lake or even a swimming pool. This baptism became your rebirth into a new life. You are no longer a child of man subject to the Second Death (Revelations 2:11), you are now a child of God. After this baptism of water, you will at some point recieve the batism of the Holy Spirit. For some this is an instant trasformation, for others it could take a little longer, and even still some may never recieve it. It doesn’t mean that you haven’t been saved, for the acceptance through faith of Jesus’ shed blood for us is all that is required for salvation. Baptism of the Spirit is when you are given an anoiting from God to recieve the gifts of the Holy Spirit. Prophecy, ministry, healing, tounges, these are all gifts of the Spirit, gifts that allow you to witness to others effectively the words of Jesus to others. After your Baptism of Spirit, will come the Baptism of Fire. This is your refinement. The purging of your fleshly nature and wicked heart into a beautiful new being of righteousness. Have you ever burned yourself on a hot oven? It’s painful, it hurts, it stings, it leaves a blister. But it goes away, and you know to be more careful next time. This is not unlike your baptism of fire. It’s going to hurt. It’s going to sting. It may leave some scars on you (emotionally, mentally, physically) but like all scars, in time they will heal. It is through this process that Jesus is refining you. Creating in you a special alloy that will not bend or break when pressured by the evils of this world. It is through these trials that we learn things about ourselves, our faith, our need for repentance, and closeness to Jesus. 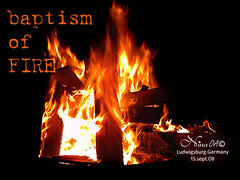 Like mankind, this earth will also recieve it’s baptism of fire (2 Peter 3:10). It has already received it’s baptism of water during the Great Flood (Genesis 7:7-12) of Noah’s time. It’s baptism of Spirit came at the crucifixion of our Lord Jesus, and soon (maybe) it will under go it’s refinement, it’s purging of the wickedness of all fleshly natures in it’s baptism of Fire. Fire is the only thing that will completely destroy the sins of this world: sickness, famine, pestilence, wickedness, hate, all of the byproducts of sin that has ravaged the world since Adam and Eve were expelled from Eden. If you are not saved, if you do not believe in Jesus, if you only believe in His history, or if you believe that through your good deeds you are saved, then sadly, you will not survive this Baptism of Fire. You will know the Second Death, and there is no ressurection from that. Aaron is a freelance writer who is passionate about covering topics that interest Christian readers. From breaking news and inspirational stories to Bible studies, Aaron is committed to providing concise, well written, and relevant articles that will inspire and encourage Christians to search for a deeper connection in their faith and God. I really enjoy looking at on this internet site, it has superb blog posts. “Don’t put too fine a point to your wit for fear it should get blunted.” by Miguel de Cervantes.